Part of why I stopped reading comics for the most part has been, well, the idea of 'oh, you don't like the A-list characters? We don't want your business.' I was getting to a point where to read about my fave characters, I'd have to wait til some writer remembered they existed, or I could keep my fingers crossed that they'd show up in a group shot background panel in the next big event. I refer to that as 'Table Scraps.' I eventually got tired of it. But, it still exists. 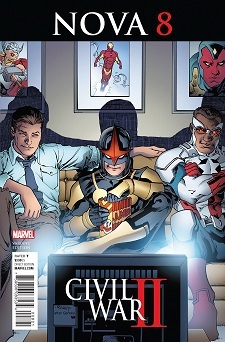 I was hoping after issue #7 last month, something about Nova's New Warrior guest stars would be up in the comic news, with Marvel NOW's 2nd wave. And while there have been some cool announcements...well, nada. So, I share this, and I keep waiting. 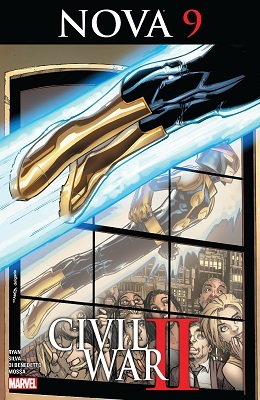 There's been mention in the new Nova series of some friends of the previous Nova showing up, as hinted in a few of the old solicitations by using the first letter of the blurb. Nova's Eventful World-Wide Adventure Rockets Roaringly Into Our Renegade Spider! I think this was how Angela was hinted at in another solicit for another book. 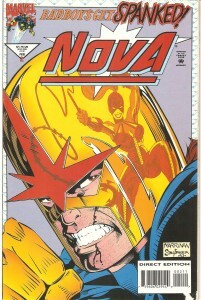 These two pages from Nova #7 definitely have my attention, since they're characters I want to read more things about. I want to believe this will be part of Marvel Now's 2nd wave. I don't recall this being posted before, but it's such a lovely image, I had to share it.